Biography: Bridget successfully ran Yoga Buzz and Rowan Moon Simple Skincare for several years before uniting with Anji to form Om Yoga Works. I began my yoga journey with the very physical Iyengar yoga but it wasn’t until travelling in India & meeting wise & knowledgeable teachers that I was introduced to this ancient philosophy properly. I moved deeper into my practise & began to live Yoga. Yoga has been my constant companion for over 20 years, helping me meet my challenges with grace & understand my personality & learning & evolving. My experience with Yoga encouraged me to share this philosophy & I began my journey to teach yoga. I trained in 2002 in an Ashram environment by the Sivananda tradition & began teaching in gyms, community projects & local classes. I continued my training with various yoga teachers & was drawn to the teaching & techniques of Satyananda Yoga & became a qualified Satyananda teacher in 2011. 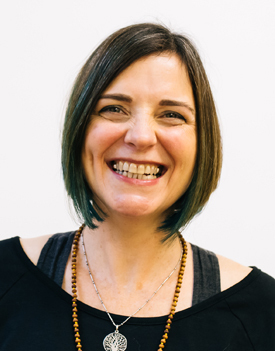 I was trained by Uma Dinsmore-Tuli in 2008 to teach yoga for pregnancy & post natal & taught a specific yoga for pregnancy class for 6 years but as I enter the autumn of my life I feel that it is more appropriate for me to teach a class for all women, we can support & acknowledge each other at all stages of our lives. In 2014 I cared for my husband Steve till his death & this really highlighted the importance of our community, we all experience ups & downs in our lives & it’s so much better to do it together. The yoga I teach is a combination of all my experiences, it is firmly rooted in the philosophy of yoga but I also see nature as my ultimate guide & teacher. My aim as a teacher is to share my knowledge so to empower others to know thyself & fulfil their highest potential. I am also a Reflexologist & Aromatherapist & make pure plant based & natural skincare. I live a blessed life with the love & blessing of my fabulous family & friends & doing all the things I am passionate about. I continue to follow my yoga journey as I strongly believe that I learn to teach & teach to learn. Call Bridget on 07904 111 334, email me or connect via our contact form.